And just like that…it’s Tuesday again! Time for another Top Ten! Last week I dazzled everyone with all the things I have found on the internet that I am drooling over hoping to get for Christmas. This week, I thought I would put the focus on my wee little man. Clearly with “Eddie” on it instead of “Ernie”. And I actually already bought this cute piece for Eddie already! I got it from Baby Butterfly Boutique…my new favorite shop for all things toddler/baby. This little stool will be perfect for lots of things in his life…getting into a big boy bed someday, standing by the sink to brush his teeth, standing by the toilet to go potty. I can’t WAIT to get this! (Oh, and I also bought him this hat as a stocking stuffer). It doesn’t have to be this one exactly, but I would like one that has chairs and a bin or bins for storage (since storage is scarce ’round these parts). My idea would be that this table (or one similar) would start out in our basement in the family room and find it’s way to Eddie’s big boy room…once it exists. Eddie really likes to “help” around the house right now, and he is big into putting things where they go, or copying Cort when he wipes something down or adjusts furniture. It’s really cute. I would love if he had his own place to “fix” things. 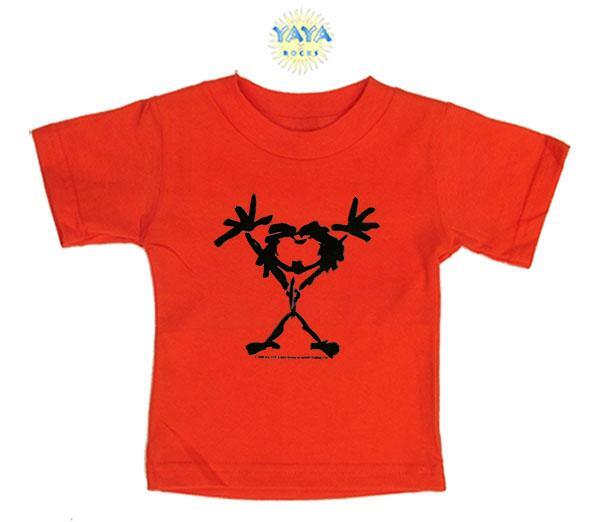 This little lovely from Bird E Studios would be a great stocking stuffer for the little guy! 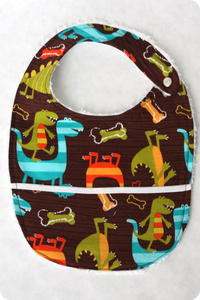 I always love for him to look cute when we are out somewhere for a meal, and this little Dino bib would be perfect for when his guitar bib is dirty. I searched Etsy and found this lovely little vintage shop and fell in love with this little rocking chair. It would be perfect in our living room and even more perfect for Eddie’s little booty cakes as he watches his morning cartoons. Eddie always needs new clothes because I like him to be the most stylish toddler ever presentable when he is in public. There are tons of clothes he would look quite handsome in from here or here, but he really does need a new Pearl Jam Tshirt. His baby onsies just don’t fit him anymore. For as much as Eddie loves to load up the laundry basket and push it around the house, I know he would fall over and love this cart. He also really likes to imitate me when I am in the kitchen. His new thing is to take every. single. baking tool I have, load it into the laundry basket, and movie it around the room. It’s like his very own food trailer. A very ghetto food trailer. Ok, I realize we can’t give the boy ALL things Sesame street, but he REALLY likes it. He doesn’t need stuffed animals or that sort of thing…instead he loves the music. He LOVES the music on Sesame Street. I think he would love some of the old seasons of the show or some CDs of the music. This is Eddie’s second winter and the first that he will be able to go out and enjoy. The thing is, to do that? He needs proper outerwear. His cousin Jack has passed down a couple winter jackets, but he needs snow pants and boots if he is going to use the sled Santa brought him last year! 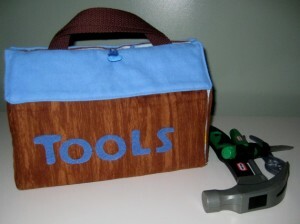 I found this ridiculously cute little handmade toolbox on etsy in a little shop called Zoogits. If Eddie doesn’t get a full sized tool bench, getting a set of tools and this little “box” would be almost better. It’s so cute…and it’s handmade! I love to support the handmade goods! There you have it! The Top Ten Things on Eddie’s Christmas List! So what items are on your child(ren)’s list? I’ve been looking for a neat activity table for Darling Girl too. It’s hard to find one that is neat without being a zillion dollars. 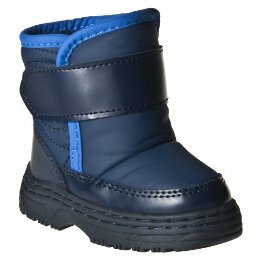 I covet the ones at Land of Nod. 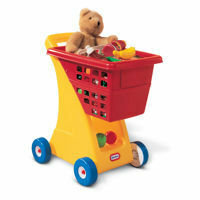 We have this – http://www.toysrus.com/product/index.jsp?productId=3872810 – shopping cart for DG and she LOVES it. Currently it has several Legos, her baby, and a couple other stuffed animals in it. 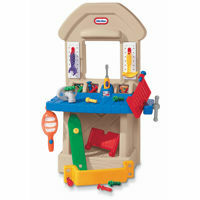 It’s easy to put together, holds lots of kid stuff and isn’t too expensive. Oh yeah, I forgot to say that Sesame Street makes several DVD’s that are various songs. DG loves them all! yes! that is what we need! A sesame street dvd just of songs! E would LOOOOVVEE that! You must get the shopping cart! my son received one as a gift for his first birthday. It has been the most used “toy” he’s ever gotten. He LOVES that thing and it seriously helped him learn how to walk. He’s now 19 months and still plays with it every single day! PS, Melissa and Doug makes an adorable one! Melissa and Doug is now my new toy obsession! Thank you for tuning me in to it! I found my godson’s present through them! I would love to get Belle an activity table but we have no room to put it. I don’t even know where were going to put the kitchen we are getting her. we would put ours downstairs if Eddie gets one. We are lucky to have a family room downstairs…although we don’t use the room much in the winter because it gets so darn cold! i kinda want one of those benches for myself. is that wrong? heck no! who wouldn’t want something with your name on it? i know! i hope E gets one! if not, we will have to cave for his bday in june for sure! I love the Sesame Street video! I usually just use You Tube and watch the classic songs! My son seems to like them… he smiles & dances! When the girls were younger they had the shopping cart! Everything went in it and was pushed around the house! we you tube them all the time too! It would be great to just throw in a dvd though! And I am seriously thinking of getting Eddie that shopping cart. It sounds like they are hits with all kids! I need…errr Chunky needs that step stool. He’s our little monkey and it would suit him perfectly. We are trying to potty train him and we’re finding it easier that he stands when he pees but we don’t have a cute stepstool. We’re using an old small rubbermade bin. I know, so ghetto of us. I also want to point out that the Sesame Street video you have listed is of the old skool variety. I found a tv station called Boom and it plays old skool SS. Man, those were the days. If only I could find him a video of the popples. My brother also you tube’s old he-man episodes and watches them with his little guy. so funny! Gage is getting invested in a train set for christmas, whether he likes it our not. and the rocking chair? You MUST check craigslist, they always have amazing rocking chairs for super cheap. Trust me. E probably won’t GET all of these things, but they are fun to wish for. 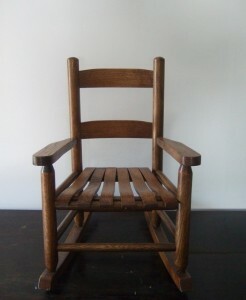 And I am now off to check the craig’s list for the rocking chairs! thanks! 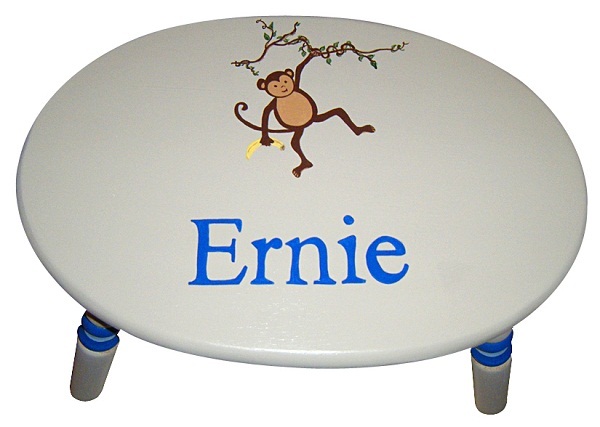 what a cute idea to get a personalized stool! that is adorable! I also love the rocking chair. So cute. And activity tables are a MUST! yes, the stool is SOOO cute! I love it! I can’t wait for it to get here! 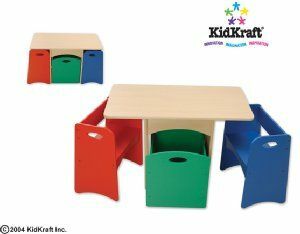 I love that the seats for that activity table go completely under the table! LOVE. I know! I am all about stuff that all fits in each other and has storage. That is why i don’t want just a regular table and chairs. I want the storage too!